Dinosaurs have been at the forefront of the hostile takeover of American public schools by the teaching of evolution for the last half-century. Indeed, evolutionists have exploited these fascinating creatures in their ongoing strategy to capture the hearts and minds of the young. Three generations of Americans have now been thoroughly indoctrinated with the evolutionary propaganda of the elitist “scientific” community. Dinosaurs have played a prominent role in that force-feeding. For decades, dinosaurs have mesmerized children and entertained adults. Many, perhaps most, adults have assumed as true the long eons of time postulated by the theory of evolution and that dinosaurs lived and died long before humans ever lived. We at Apologetics Press have long hoped for a book for adults that explains the place of dinosaurs from the biblical perspective—from the Genesis account of Creation to the experiences of Job. That hope has now been realized. 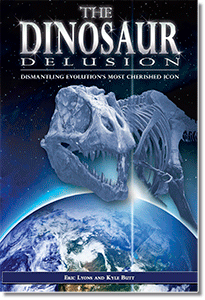 We are delighted to announce the arrival of our latest scientific production: The Dinosaur Delusion: Dismantling Evolution’s Most Cherished Icon. There is nothing on the market like this book. Written in an engaging style, with full-color illustrations throughout, this book is a must-read for anyone interested in the field of Christian Evidences. It would certainly make an outstanding Christmas gift for your loved one or friend. Why not order yours today?